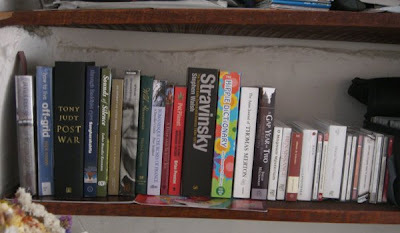 For four weeks in France my appetite for music was met by France Musique, a wide ranging selection of CDs and books (see above), and much fine live music. When I drove off the cross-channel ferry last Monday I retuned the car radio to BBC Radio 3. Within an hour the presenter had plugged the BBC's New Generation Artists Scheme so many times that I concluded she was earning a bonus for every mention. Between the plugs there was much other useful information, such as "the violinist was born in 1983, which means she is now 24". And later in the afternoon Sean Rafferty fawned over every act a desperate record company or concert agent sent along to the In Tune studio. The next day the morning presenter helpfully explained to me why I should appreciate Jordi Savall's Bach, while in the evening classical-jock of the week Tom Service started the network's birthday tribute to Sir Colin Davis by leaving studio guest Mitsuko Uchida's microphone closed for the first thirty seconds of her contribution. Then, yesterday, a tribute to record label Lyrita, which promised so much, sounded like a promotional video for a bio-tech company. It came complete with customer endorsements delivered over Stanford's Second Piano Concerto, a work which sounds like film music even when it is not being used as the background for a voice-over. The patronising presenters could be ignored if they were introducing great radio. But, today's ratings driven Radio 3 has come up with its own inversion of Lord Reith's vision for the BBC, and the network's programmes now, invariably, offer the public 'something worse than it ever thought it wanted'. This kind of post doesn't make happy reading, or happy writing. But there will not be many more like it, which will please my regular readers at webgw2.thls.bbc.co.uk (British Broadcasting Corporation). After 40 years of almost daily listening I have decided that BBC Radio 3 will no longer be my default radio station. Instead, my default will be Radio 4 and the long tail of internet stations, supplemented by CDs and some much needed silence. Radio 3 will now be a 'destination station', only listened to for worthwhile concerts and programmes such as Iain Burnside's and Michael Berkeley's. Iain's programme today, with his guest, A. C. Grayling, and the Elisabeth Lutyens motet, was an oasis in a desert of mediocrity. Coincidentally, today is the 40th anniversary of the first day's broadcasting on BBC Radio 3. But for this listener it is the day the music died. There are now much better alternatives. Access one of them by clicking on the image below to to launch the Radeo internet player, and listen to Polski Radio Dwojka. Now read more about the future of radio. I agree completely about the delights of the radeo internet player. I've recommended it to a few people. All is not quite skittles & beer just yet, however. Perhaps 10% of the stations I've tried give a "bad link" error, or can be played from outside radeo but not inside. Also, stations vary widely as to whether they'll let you know what is being played. I'm in the same situation as you are; I'm in Canada, and have just given up on CBC Radio 2 as my default station. Sometimes I connect my laptop to my stereo system, and if you'll permit a product recommendation, I'm very satisfied with the Xitel HiFi Link as my connection mechanism ... definitely better than than a simple y-cable connection. See http://www.xitel.com/USA/prod_hflpc.htm . Mind you, at the moment I'm on my back deck doing some work and with radeo playing SR Klassiskt from Sweden through my small powered speakers. Blue sky, 21 Celsius, leaves starting to turn. Could be worse. Miss Mussel ditched CBCRadio2 about six months ago in favour of its arch-rival Espace Musique. There is a large variety of music on offer although you may have to overlook the occasional cheesy French pop song. There is great jazz starting at 4 or 5, leading up to a classical concert at 8. I hear you on R3. But, when it comes down to it, what are we looking forin the radeo.net channels? Music? We can get that anywhere now. So maybe it is the randomness. We probably don't know what is coming next. And there is perhaps more likely to be something interestingcoming than on R3, with less chat. And we don't always understand the chat. An exotic voice introducing something can be attractive, and so can randomness. But isn't that about it? The music is the same. Theonly thing which distinguishes a good radio channelfrom the civilised disc-jockey-delivered channels intons of places is the making of ... hushed silence ...programmes. Programmes are still occasionally made on R3. I can think of one or two this year -- Elgar, Takemitsu, the Britten opera series. Nobody ever did that better than the Beeb. But who else ever does it? So what are we praising with radeo.net? David, thank you for that. You make some interesting points, and here are my thoughts on them. Radio 3 has become formulaic. The presentation style follows a formula (patronising, matey, etc) and the repertoire follows a formula (mainstream with lashings of 'cred composers' such as Shostakovich, plus regular outings for a limited number of approved contemporary composers, Adams, Glass, etc). Most classical stations also follow a formula, although thankfully many of them are not as cringe inducing as today's Radio 3. I am very clear what I am praising. It is that the Radeo player is a search engine for music (and talk). Think Google and websites, translate that to Radeo and internet stations. Search engines revolutionised the web, applications like Radeo will revolutionise online radio. The Controller of Radio 3, Roger Wright, thinks that he can still tell us what we are going to listen to, and how it will be presented. The Radeo internet player empowers the listener. Now I can decide what I am going to listen to, and I can share my discoveries with friends and readers, and create communities of common interest - which is precisely what the readership of An Overgrown Path is. The music may be the same. But control has switched from broadcaster to listener. I actually heard one of the announcers say "That Mozart, what a guy!" We leave the radio on KDFC to entertain our parrots when we're not around. Stricly for the birds. Click on the link above and listen for yourself. They will play the Haydn Trumpet Concerto at least once a day. No joke. Thank goodness for internet radio! It's probably understandable that the controller insists publicly there's nothing wrong with Radio 3's presentation. However, that needn't prevent him making changes when the evidence of listeners' negative reaction becomes overwhelming. Deserters may not agree on every detail about current programmes but they do agree that the best action to take is to switch off.